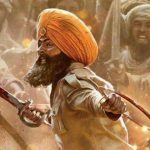 ← Chakravyuh has nothing new to offer! It was the first time I saw tulips. One of my earliest movie memories is a pale, almost blurred recollection of a field of vibrant colours. It was quite easily the most beautiful ‘giant garden’ I had ever seen. The only other thing I remember about that film is a bright fire following a plane crash and some palpable tension. I was too young to fathom what was going on but I could sense all is not well. But when you’re as little as I was then, troubles are forgotten in ravenous slurps of ice cream. Eventually, I forgot about the fire but never stopped thinking about the tulips. When my husband (then boyfriend) was doing his Masters in the US, in a bid to feed my fascination, I asked him to bring me a few pressed tulips in his notebook. This is the magic of Yash Chopra and his gift to craft lingering imagery. And Silsila was my first experience of the same. Whether we admit it or not, films do influence and form our ideas about certain concepts and emotions. On some subconscious level, Yash Chopra’s elegant portrayal of romance and everything associated with it — from dating to daydreaming — shaped my expectations and understanding of what love ought to look like during the impressionable juncture of my life. Or at least what I hoped it would be. I adore the passion of his men and women. Sometimes the guy hugs his girl so tight, pleasantly embarrassing her with loud proclamations of his feelings before they vroom off into the broad streets of Central Delhi. Sometimes he is the serious, profound type gazing at his beautiful muse and gush ardent poetry before they proceed to lie comfortably under an enormous tree where he gently caresses her meticulously set tresses. Sometimes they jump inside a barrel full of grapes and squish it to pulp with their stomping feet against a stunning vineyard. Sometimes he tells her they’re off for a trip to Goa only to surprise her with a honeymoon in Switzerland. I have always admired just how larger than life his leading ladies are. 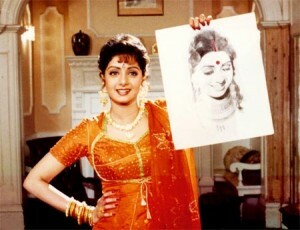 At some point, every girl wearing a white churidar or sari has thought of herself as Yash Chopra heroine. Even if it’s his more delicate, feminine creations in pastels and chiffon, swirling around daisies and kissing the rain that we tend to remember and emulate, a Yash Chopra heroine also embodies dignity, strength and fierce independence. Be it Nanda in Ittefaq, Raakhee in Trishul, Parveen Babi in Deewar, Neetu Singh in Kabhi Kabhie, Rati Agnihotri in Mashaal, Sridevi in Chandni and Lamhe or Karisma Kapoor in Dil Toh Pagal Hai, women have always played a prime role in conveying the soul and spirit of his stories. 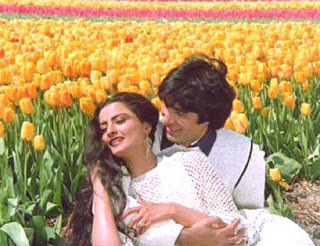 It’s not just his apparent love for capturing the splendor of nature while his besotted lovers take a stroll against majestic valleys, sprawling meadows and that cutesy black and white Swiss cow, but that distinct Yash Chopra aesthetic is visible indoors as well. 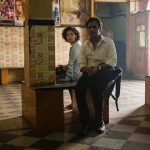 Since most of his stories revolve around affluent folk, the filmmaker didn’t miss any chance to provide the necessary grandeur without ever resorting to kitschy or stuffy elements. Every single prop is carefully picked and adorns elegant interiors reflecting class and sophistication. This very refinement and classy restraint are deep-rooted in the conversations — the quality of dialogue, choice of words and the mode of delivery — of all his characters. Whether it’s a scowling Amitabh Bachchan in Deewar or obsessive Shah Rukh Khan in Darr, even hostility is conveyed with decency in a Yash Chopra film. There’s no place for crass in his scheme of things, a trait that possibly delineated him from his more raw, realistic contemporaries. But I do admit to watching Lamhe the maximum number of times. Even though I was only a school kid, I could comprehend the depth of Viren and Pooja’s emotions and turmoil and the delicacy with which Yashji had treated a socially-frowned possibility into a beautiful reality. Its climax is one of the most flawless declarations of love for me. After I began my journalistic career at rediff.com, I spoke to him once, over the phone, for his response on the subject of insuring films. It was a brief chat but I was impressed by how accessible he was even at the top of his game unlike his much junior colleagues with just one hit film to their credit. The second time I saw him in action on the sets of Veer-Zaara, while I was there to interview Amitabh Bachchan. The enthusiastic filmmaker was filming the Lohri song and the vibrant set resonating the warm camaraderie between him, AB, Shah Rukh Khan, Preity Zinta and Hema Malini. Like that popular cliché goes: one big, happy family. Only this time it was really true. The third memory is my favourite. Earlier that day, my husband had proposed marriage to me in a manner that would make Yash Chopra most proud. To celebrate this dear development we stepped out to Andheri’s Indigo Café. As we browsed through the menu, I subsequently noticed three gentlemen sitting adjacent to our table. And who might they be? Yash Chopa and his sons—Aditya and Uday. But it wasn’t the Kodak moment that flashed before my eyes. Just the idea of the Father of Romance being right there, right then felt surreal, silly, sweet, and fun and, what the hell, I loved it. ‘It’s a good sign,’ I joked. Thank You, Yash Chopra. Thank you for making me realise that romance lies in everything and nothing. Thank you for doing what you believed in till the end. You live in every lover’s heart. And I’ll always have the tulips. This tribute was first published on rediff.com. This entry was posted in Columns & Reviews and tagged romance, tribute, yash chopra. Bookmark the permalink. You met Yash Chopra on the day you got engaged? Wow! Like WOW!